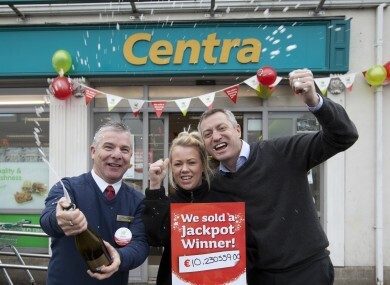 Centra staff celebrate selling a winning lottery ticket. CENTRA HAS CREDITED its new “health strategy” for helping it to cement top position in the convenience-store industry with more than €1.5 billion in sales across Ireland last year. The network of more than 460 outlets took in €1.54 billion for 2015 – a slight increase on its turnover for 2014. The company said one of its top achievements for the year was reducing the calorie intake of customers by reducing the shelf space dedicated to fizzy drinks. It also recorded a €6 million boost in sales for its ‘live well’ products like pre-prepared salads and fruit pots. The convenience-store chain, which falls under the franchise division of SuperValu parent Musgrave Group, is expected to add another 16 new stores this year, employing another 480 people on top of the near-11,000 it already has on the payroll. Centra managing director Martin Kelleher said the company had seen “massive spikes in demand for nutritious products”. Its stablemate, SuperValu, last year dethroned Tesco as the market leader in the Irish grocery market after years of dominance from the UK chain. Meanwhile, turnover at the South African-owned BWG Group, Centra’s biggest rival with its Spar- and Londis-branded stores, hit 16.9 billion rand (€970 million at today’s rates) in the year to the end of September, 2015. Email “Ireland's top convenience-store chain says its 'health strategy' helped it deliver record sales”. Feedback on “Ireland's top convenience-store chain says its 'health strategy' helped it deliver record sales”.